We love IPAs here in the Northwest. That’s a given. In fact, IPAs from the Northwest and West Coast in general have led some to push for the formal creation of a new IPA category: The West Coast IPA. Our IPAs out here are generally hoppier, a bit stronger on average and have that wonderful citrusy and/or piney character. With so many great IPA options available, making a selection can be challenging at times. I’ve done several blind tasting to verify some of my favorites and one of those favorites, Wisdom Seeker, is making it’s return once again from Black Raven Brewing Company (CBM Sponsor). Redmond, WA – Some folks seek wisdom from books and some seek it in the solitude of nature. Others may seek it from their friendly neighborhood bartender who probably deserves an honorary degree in psychology. 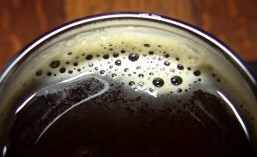 At Black Raven Brewing, we are too busy brewing up delicious beer for the flock to get too philosophical about it all. We’re simply content when the bird orders another pint. And if we’ve learned anything, its that the only true knowledge is knowing that you know nothing at all. Wisdom Seeker Double IPA gets its special powers from an enormous amount of hops and malted barley. Brewed in the West coast Double IPA style, this bold brew features massive citrus and herbal hop additions and a full hop aroma. Brewed with six different hops including Centennial, Simcoe, Amarillo, Citra, Chinook, and Nugget, Wisdom Seeker is a hop lovers dream come true. Seek your wisdom cautiously; this hop feast packs a punch. Black Raven Brewing Company will release Wisdom Seeker Double IPA at its taproom on Saturday February 20th and to retailers on Monday February 22nd to the delight of beer drinkers across Washington and Alaska. It will be available in 22oz bottles and Draft for a limited time so stop by the Black Raven Taproom in Redmond or by your favorite watering hole or bottle shop. Black Raven is an award winning brewery founded by Beaux Bowman and Kathryn Gillespie in 2009 in Redmond, WA where it operates a 15-barrel brewery as well as a taproom. Head Brewer and Founder Beaux Bowman’s goal is simple: build a brewery that not only crafted beer that he wants to drink, but also be a brewery that he wants to work in. Current distribution is limited to Washington state. Signature beers include Trickster IPA, Coco Jones Coconut Porter, Second Sight Scottish Ale, as well as seasonal favorites such as Kitty Kat Blues Pale Ale and Grandfather Raven Imperial Stout. Mark your calendar for one week from today, Saturday, February 20th, and come on out to The Raven’s Nest (Black Raven’s brewery taproom in Redmond) to enjoy some Wisdom Seeker on tap and pick up a few 22 oz bottles to go. The bottles are $8.99 + tax and there is a 1 case per person per day limit. As noted above, Wisdom Seeker should also start appearing at other local retailers by Monday the 22nd. This entry was posted in Beer, Beer Release, Brewing, Hops, Imperial, IPA, Local, Redmond, Washington, Washington Beer, Winter and tagged 2016, beer, Beer Release, Black Raven Brewing, February, IPA, Redmond. Bookmark the permalink.